Late in 1945, Winston Churchill had the splendid and characteristically generous idea of commemorating his 1940-45 Coalition Government—which had only broken up six months previously—by striking a large bronze medallion. In early 1946 he presented one to every member of that government, as well as to others. In all, there were 136 of these magnificent, four-inch diameter objects, each weighing 8.7 ounces. They were cast at Churchill’s own expense by the foremost manufacturer of such things, Spink & Son, a company founded in 1666. Each recipient had his or her name engraved on the medallion, with the words “From Winston S. Churchill” on the obverse, within a victory wreath of oak leaves and acorns. On the reverse were engraved the words, “SALUTE THE GREAT COALITION 1940-45.” Each was treasured by the recipients and their families ever since. The first time I saw one was in 1988, when I interviewed the former Lord Chancellor, Lord Hailsham, for my first book, The Holy Fox: A Life of Lord Halifax. As Quintin Hogg, he had been the Parliamentary Secretary in the Air Ministry from 12 April 1945 until the end of the Coalition on 23 May of that year. Even holding the most junior post in a ministry for a mere five weeks qualified one for the medallion. He had his set in glass and displayed it proudly on his mantelshelf. One hundred twenty-two medallions were made for ministers, but another thirteen non-politicians also received one. They included the three Chiefs of Staff: Field Marshal Lord Alanbrooke, Admiral of the Fleet Lord Cunningham, and Air Chief Marshal Lord Portal. Other recipients included Field Marshal Jan Smuts, the South African premier; Admiral Lord (Louis) Mountbatten; Generals Bernard Montgomery and Harold Alexander; and Edward Bridges, the cabinet secretary. General Sir Hastings “Pug” Ismay, who had been Churchill’s chief of staff, and Canadian Prime Minister William Mackenzie King were recipients. A posthumous medallion was given to the eldest son of former First Sea Lord, Admiral of the Fleet Sir Dudley Pound, who had died on 21 October 1943. It is likely that Mackenzie King’s was at least in part awarded for hosting the 1943 and 1944 Quebec conferences. His Australian and New Zealand prime ministerial counterparts were not on the list. 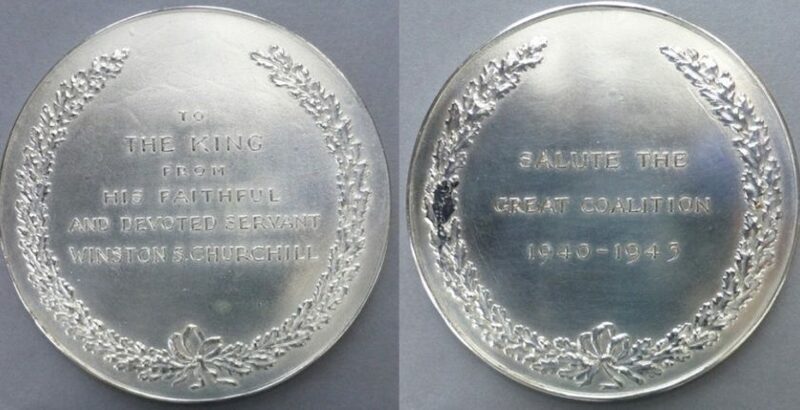 One more medallion, which he had made in silver electroplate, Churchill gave to King George VI, with the words, “It would make an excellent paperweight.” Instead, the King gave it to the British Museum. The medallions very rarely ever come up for sale, but can fetch anything in the region of £10,000 or more, depending on the recipient. Pug Ismay, in his memoirs (1960), praised the medallion presented “to his wartime colleagues of all political parties….Let us do so with thankfulness in our hearts that, in the days of our trial, the Ministers of the Crown were worthy of the people whom they represented.” Might there be a hint of reproach in Ismay’s words about the quality of the peacetime ministers who had replaced them? I never commanded an army or a large ship, or a flight of aircraft. The highest rank I ever held in the war was as a lieutenant in the Royal Naval Volunteer Reserve, commanding about twenty-eight men. When I returned to active parliamentary life at the end of 1943, thus just qualifying in time for Winston’s historic medallion—which we all treasure—I only went as number two in the Ministry of Aircraft Production, though before long, I did go into the Cabinet. There are some questions that naturally arise concerning the medallion, which probably cannot be answered at this great distance of time. Many were clearly presented on the criterion of the recipient having held ministerial office between 10 May 1940 and 23 May 1945. This included some who had resigned in disgrace (Robert Boothby); who conspired against Churchill for the premiership (Sir Stafford Cripps and Lord Beaverbrook); who frankly hated Churchill (John Reith); and who were disliked by Churchill (Hugh Dalton). He could hardly have made exceptions on any of those grounds. But what was the criteria for the other thirteen recipients? Why did one Supreme Commander (Mountbatten) get one, yet not another (Field Marshal Sir Henry “Jumbo” Wilson)? Why two successful battlefield generals (Montgomery and Alexander) but not Field Marshal Lord Slim? Was lack of overall success the reason Generals Wavell, Gort, and Auchinleck were denied them, despite having played important roles during the war? If Admiral Pound could get one posthumously, why not Admiral Sir Bertram Ramsay or Field Marshal Sir John Dill? Or indeed the descendants of Neville Chamberlain, Lord Moyne, Kingsley Wood and Lord Lloyd, who had served in Churchill’s Coalition Government but died before victory was won? One might have assumed that the extra thirteen medallions simply went to people Churchill liked personally. Yet Edward Bridges was not close to Churchill and received one, whereas several people who were close to him, such as Ian Jacob and Leslie Hollis, did not. All we can say with any certainty is that, as an historian, Winston Churchill knew that there was a long and noble history of commemorating great events with bronze medallions. He continued that tradition in a notably magnificent and profoundly generous way. In 2008 Mr. Roberts wrote A History of the English-Speaking Peoples Since 1900, the logical successor to Churchill’s History of the English-Speaking Peoples. This November brings his new biography, Churchill: Walking with Destiny, which can be pre-ordered now in print or Kindle.